I try to be a glass half-full type of guy, but there's no dancing around this subject: Week 8 is the worst week of the college football season in terms of quality games, and it's not close. OK, Week 15 technically only has Army-Navy, but I don't count that. But at the halfway point, it's a snoozer. There's just one matchup featuring ranked teams: No. 15 Texas A&M at No. 24 Ole Miss, with the loser likely out of the SEC West race. The Rebels are 5.5-point favorites, and they welcome back perhaps the nation's top offensive lineman in Laremy Tunsil, a tackle who is an expected Top 5 pick in next year's draft. He hadn't played yet this season because the NCAA was investigating him for accepting some benefits -- Tunsil had to pay back some money and serve that seven-game suspension. Awesome individual matchup in that game between Tunsil and another future NFL Top 5 pick, Texas A&M defensive end Myles Garrett. The sophomore Aggie might be the top pick in 2017. He's a monster. Even though there appear to be a lot of mismatches this week, you can often get value there on the underdogs because the power teams are looking ahead to the next game. On my Opening Line Report, I loved Western Kentucky and the points at No. 5 LSU for that very reason. Apparently others have agreed, because that line was 16.5 on Monday but is now 15.5. Here are some news, notes and any line moves for some of Saturday's games around the country, in no particular order. Iowa State at Baylor (-37): I touched on this game in my Opening Line Report and took the points as I think Baylor will be peeking ahead to its next game. The total interestingly has dropped from an open of 81.5 to 78. I'm writing about this again because Bovada has a special on Baylor, the nation's top offense, this week. It asks if the Bears will score at least 60 points for a record sixth straight game, with "yes" at -110 and "no" at -130. Baylor is averaging 63.8 points per game and has tied the record of five straight 60-point games set by the 2008 Oklahoma Sooners. That team was led by Heisman Trophy winner Sam Bradford and played in the National Championship Game but was held to just 14 points in an upset loss to Florida to end the 60-point streak. Oklahoma scored a record 702 points that year; BU has 383. No. 3 Utah at USC (-3.5): Explain this line to me. The unbeaten Utes, who already have impressive wins over Michigan, Utah State (that looks impressive after what USU did to Boise State last week), Oregon, Cal and Arizona State, are underdogs at a USC team in turmoil and having lost three of its past four games? The Utes are the highest-ranked team to be an underdog against an unranked team in the last 20 seasons. Do I think that the Trojans have more overall talent? Certainly. But star QB Cody Kessler has struggled the past two games with four picks; Utah is plus-12 in turnover margin, second-best in the country. Utah is also tied with West Virginia for the national lead in interceptions per game at 2.16. The Utes lead the Pac-12 in rushing defense and are No. 2 in scoring defense. USC might be down injured receivers Darreus Rogers and Steven Mitchell Jr. What adds more intrigue to this is Utes coach Kyle Whittingham was the Bovada betting favorite to be USC's head coach next season. He issued a non-denial denial about the job this week. No. 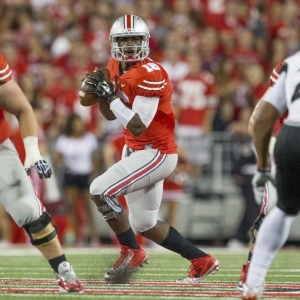 1 Ohio State at Rutgers (+21.5): This line has jumped a point from its opening. Is it because the Buckeyes have made a quarterback change? Cardale Jones, last season's national championship hero, has been demoted, and last year's regular-season starter, J.T. Barrett, will return to that role. Jones might regret not having turned pro after last season as he had a lot of buzz around him. Barrett has been better this season on third downs and in the red zone. Barrett also is a much bigger threat with his feet. He is averaging 7.9 yards per attempt and has already scored five rushing touchdowns on just 29 carries. Last year's Big Ten player of the year, Barrett has accounted for seven touchdowns (five running and two passing) the last two games in relief of Jones. It was no-brainer move for Urban Meyer. This isn't one of those look-ahead games for OSU as it goes to a blah Illinois team next week. By the way, this week's schedule is so lame that this is the ABC national TV prime-time game. Wyoming at Boise State (-35): As of this writing, this line has moved more than any other game as BSU opened at -31.5 and got as low at 31 at some books. Might the Broncos be a bit flat off last week's 52-26 upset loss at Utah State? Boise had an incredible seven first-half turnovers in that game and eight overall. The Aggies scored 21 points in the final 85 seconds of the first half thanks to two fumbles and the interception. That ended Boise State's chance of being the Group of 5's New Year's Six bowl representative, and now it needs Utah State to lose twice to have any shot at playing in the Mountain West title game. The Broncos are 94th in the nation in yards per rush, tied for 106th in sacks allowed (19, which count against rushing yardage) and tied for 121st in tackles for loss allowed (54) despite returning all five starting offensive linemen from last year's dominant offensive team. So why is Boise such a big favorite? Wyoming (1-6) is terrible -- it lost by 19 at home early this season to Eastern Michigan, one of the worst programs in the country. And the Cowboys being shut out Saturday seems likely. Boise State hasn't allowed a point on its home blue turf since the 7:29 mark of the fourth quarter of the season-opening 16-13 win over Washington State on Sept. 4 (and Cougars didn't have an offensive TD). BSU is looking for a third straight home shutout at home for the first time in school history. Wyoming is No. 111 in scoring at 20.3 ppg.